While Citgo traces it’s origins to Oklahoma in 1910, by the 1990s the company was fully acquired by Petróleos de Venezuela (PDVSA) which is Venezuela’s state-owned oil and natural gas company. Many have criticized the way PDSVA has been used as a political tool for Hugo Chavez’s socialist government. In 2007, for example, PDVSA expropriated assets in Venezuela owned by ExxonMobil and ConocoPhillips, just as Argentina more recently expropriated assets of the Spanish oil company Repsol. Claims of $12 billion in losses remain before the World Bank’s International Centre for Settlement of Investment Disputes. 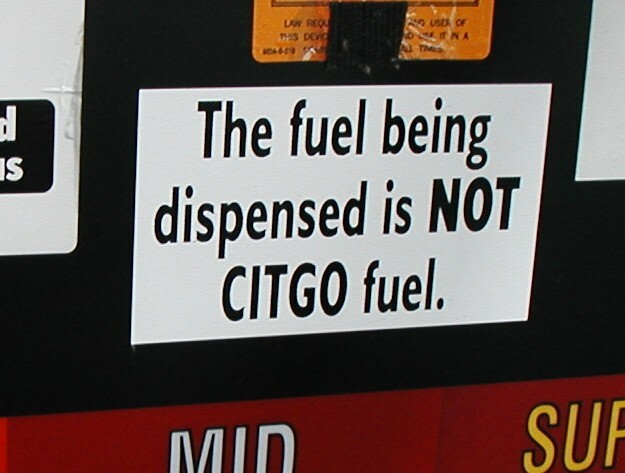 Message shown on a Citgo station at a 7-Eleven store photographed in USA. Approximately 30% of United States oil imports come from Latin America via Brazil, Colombia, Ecuador, Mexico, and Venezuela by 2010 estimates. Nearly 10% of that comes from Venezuela, which is the fourth largest supplier of oil imports into the United States. Other US companies making use of oil imported from Venezuela include Chevron, Exxonmobil, Marathon, Phillips 66, and Valero according to the US Department of Energy. InsightSur.com is licensed under a Creative Commons Attribution-NonCommercial-NoDerivatives 4.0 International License. Permissions beyond the scope of this license are found here.